Bobbi Gibb is a lawyer, artist, writer, philosopher, and mother. The inspiration for all she has done comes from her spiritual sense of life, the beauty and mystery of nature, and the wonder of the human experience. Bobbi became the first woman to run the Boston Marathon in 1966. 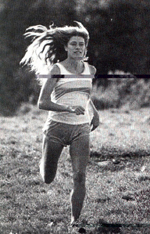 She ran again in 1967 and 1968 and placed first in the women’s division. She was inducted into the Road Runners Club of America Hall of Fame in 1982.